Aside from admiring anime and manga culture, I also had time this summer to see how Western media and their characters are received in Japan. I let this blog entry rest for a while, but I think it’s about time for some long-awaited thoughts on Disney in Japan. Because Disney’s anniversary is also celebrated intensely there, I had enough reason to go to Disney Tokyo. Before that time, I attend a small Disney museum in Kyoto that models the museum from Disney theme park. I check reproductions of the park, sketches, cells, storyboards as I’m tightly squeezed behind rows of Japanese teens. Everyone here is excited about Mickey, that’s for sure. Strolling through Osaka’s station, I spot a line of fashionable Disney bags for mature women. Not the kind with the characters on them per se, but designed in their colours and with a small key chain of, for instance, Winnie The Pooh’s honey jar. Downtown in Osaka, in Ameru-village, I go to a large Disney store, similar to the one in Manhattan. 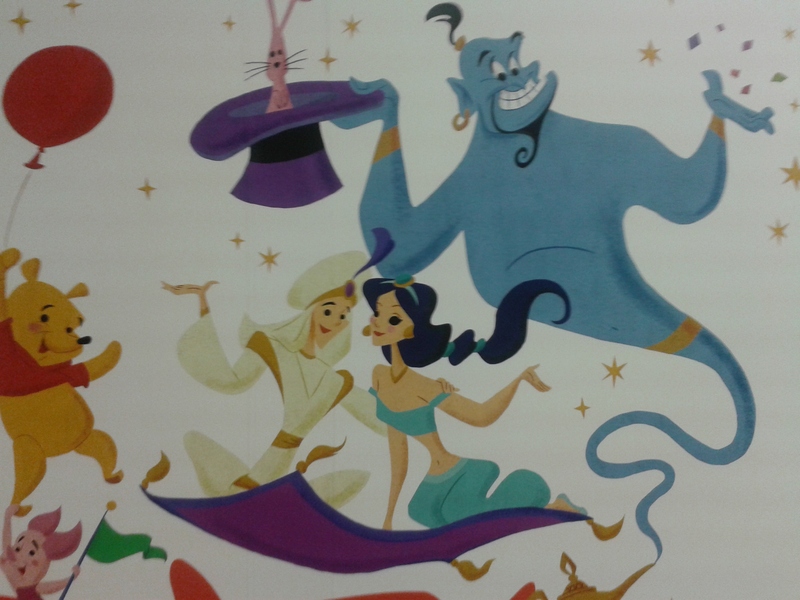 Sometimes, Disney ‘s characters are promoted in a more Japanese style, like here. This anniversary art was also printed on Kyoto’s museum bags. 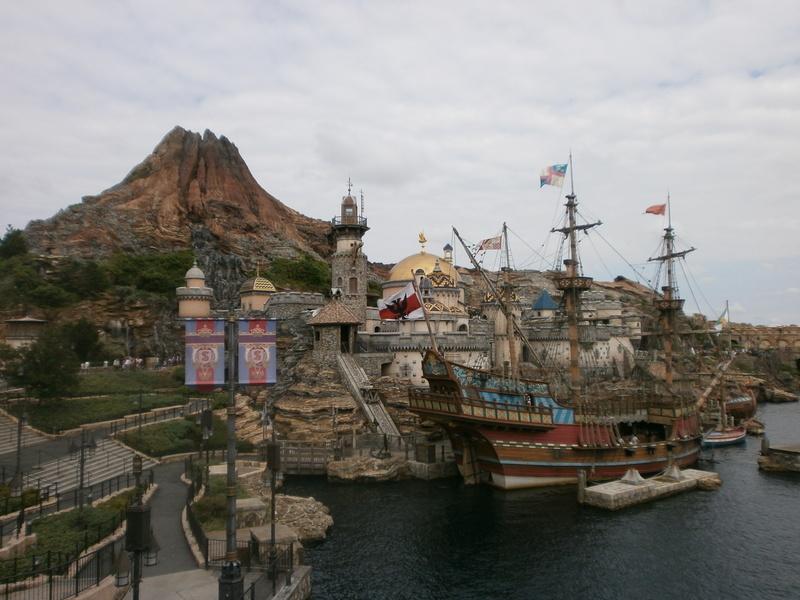 Tokyo’s Disney Sea Park is the only located outside of the USA. Visiting it was damn special. I loved the architecture of the park, that seemed more consistent than theme parks often are. Though Sea Park was also divided in different worlds, they at least shared some commonalities and weren’t build in exceptionally different styles. It helps that the park is structured around different harbours and water themes from around the world (e.g., Cape Codd, Venice) and seamlessly blends Disney movies in these such as The Little Mermaid and Aladdin. I was there when it was pretty warm and the Japanese have habits of wearing funny towels over their heads then. Couples with Mickey and Minnie ears could be spotted all over. At the park, I mostly focused on attending all the shows. Legend of Mythica was just playing, a water show that combines folkloristic, Southern-American dances with action-packed water scooters crossing the harbor. 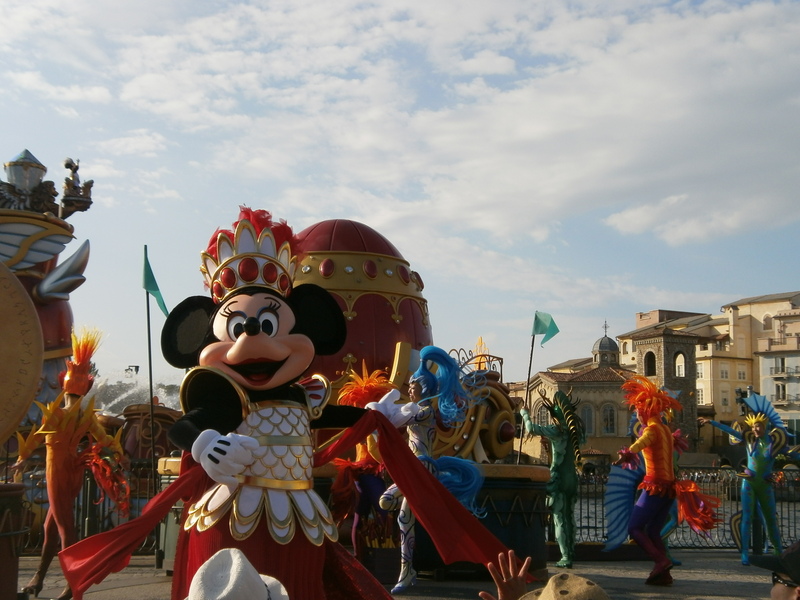 In huge boats, shaped like dragons and unicorns, the Disney characters appear and dance along. The show Fantasmic was inspired more by Fantasia and showed Mickey conjuring up images of Disney characters and movies. The show celebrated Disney’s anniversary with fireworks, fountains, projections on boats and balloons. I have little works to explain how brilliant it was, but if you’ve seen any of the Disney anniversary shows, you have a pretty good idea of what this was. If you haven’t, here’s a pretty good movie. In terms of rides, I’ll just mention two of my favourites since there’s too much goodness in the park. “Sinbad” is a beautiful dark ride with animatronic puppets, a bit reminiscent of “It’s a small world after all” and “Pirates of the Carribean”. 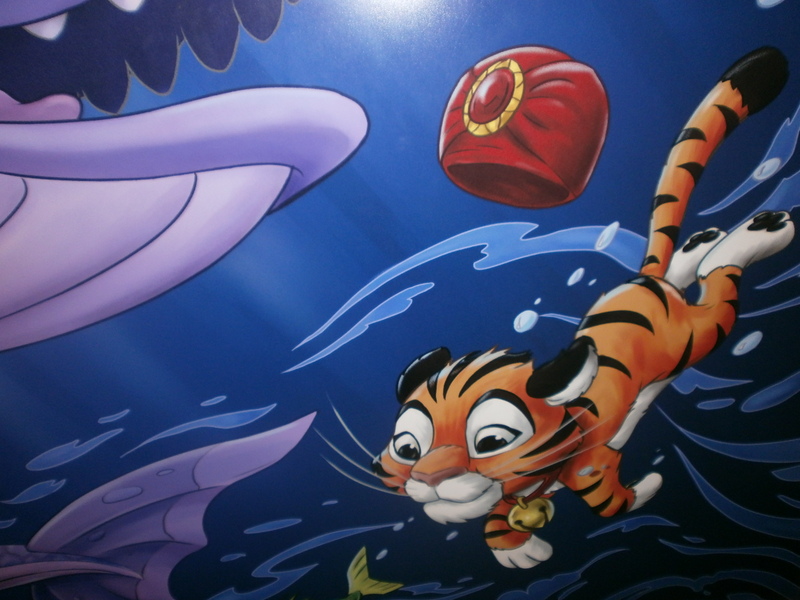 You join Sinbad and his little pet tiger on his storybook voyage. The ride’s soundtrack, in particular, stands out as it only consists of one song, Compass of Your Heart, which resonates throughout the ride from area to area. I also adored the animatronics of the puppets which was done very well and lively. For a cartoon-styled ride, it looked darn realistic. 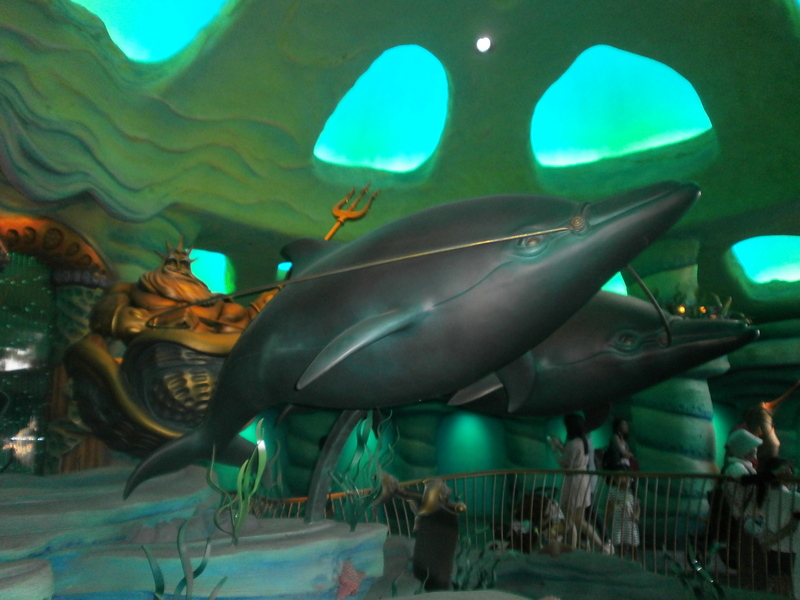 Some rides I found mediocre or old-fashioned, considering how new Disney sea is, particularly the dark ride“20.000 miles under the sea” (two hour wait for 2 minutes of clearly fake underwater ride) and “Stormrider”, a pretty boring simulator. If you ever go to Disney Sea Park, don’t forget to get fast pass tickets for some of the good rides. The lines can be quite exhaustive and many people get fast passes, meaning that you will be in the normal line even longer. You can’t get two at once, believe me, I tried, so schedule your rides well. Particularly, I am fascinated by the different characters that are hip in Japan. When I’m in a different country, or read/watch Disney localizations, I’m always interested to see what characters settle into particular cultures and which ones don’t. The Japanese are fascinating in this sense because it’s not only a question of choosing Donald over Goofy. In the Japanese shops and the Disney shops in general I bump into much Stitch merchandise but also Marie, from The Aristocats, is used to brand cute girl accessories. Alice in Wonderland is also popular. Other than products that pertain to the Disney movie, it’s easy to find products based on the original books that show a clear Disney vibe. In the Takarazuka stores, for instance, I saw lots of Alice in Wonderland merchandise that blended the nostalgic, classic style of the musicals with Disney features. Alice in Wonderland has a bar in Tokyo, makes appearances in popular culture non-stop, and illustrates fashion items. Though the Japanese are very fond of Mickey, his older brother Oswald is also happily sold on shirts and toys. It is quite difficult to find merchandise of Oswald in countries other than Japan, whose audiences may have only heard of Oswald since his appearance in Epic Mickey. This is something that I appreciate about Japan. The Japanese show a different reception to Disney characters and fully different market than the Western consumption of Disney. Their reception is partly informed by overlapping ideas and tropes in manga and anime (e.g., Stitch feeds nicely into their creature/monster genre), exotic ideas about Europe (e.g., French cats) and ‘kawaii’ or cute products. 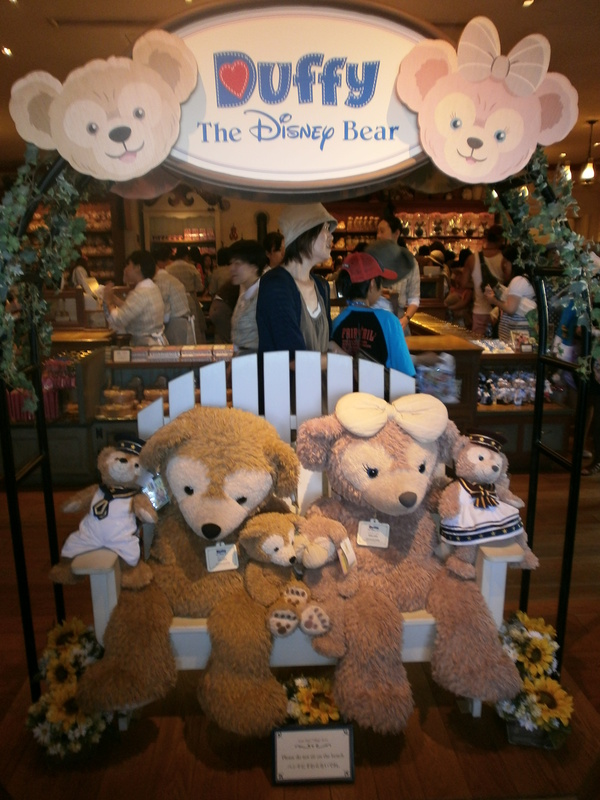 At Disney Sea Park, a rather obscure character, Duffy the Disney bear, is quite successful. Kids want to have their picture taken with him; he stars in shows with Mickey and Donald and even has his own store. Since I have never heard of Duffy, I check online whether he is from a local Japanese Disney production. Apparently, he is American, more or less. He originated from a marketing stunt in Disney USA but never gained ground there. His close relation to Disney marketing does explain the print on his face that looks exactly like a Mickey Mouse silhouette. The Japanese rejuvenated said ‘Disney Bear’, called him Duffy, thought of an elaborate fictional world and other bears, and by now he is the cherished icon of Disney Resort since 2004. Duffy is a hit, not only because he represents Western values and cuteness, but also because he is customizable. You buy one Duffy bear and you can keep enhancing it with nice outfits. Some of these are special editions so that, in the spirit of Disney consumption, you keep buying. After the Japanese adopted Duffy and altered his entire background, the Americans re-introduced him in 2010. Overall, the interest in Disney in Japan interests me and visiting the park, different museums and stores, makes me aware just how global this company really is. There’s something really special about seeing the whole world embrace Mickey and Donald like this.